A tall, pink lady is visible from the Nevada ghost town of Rhyolite. 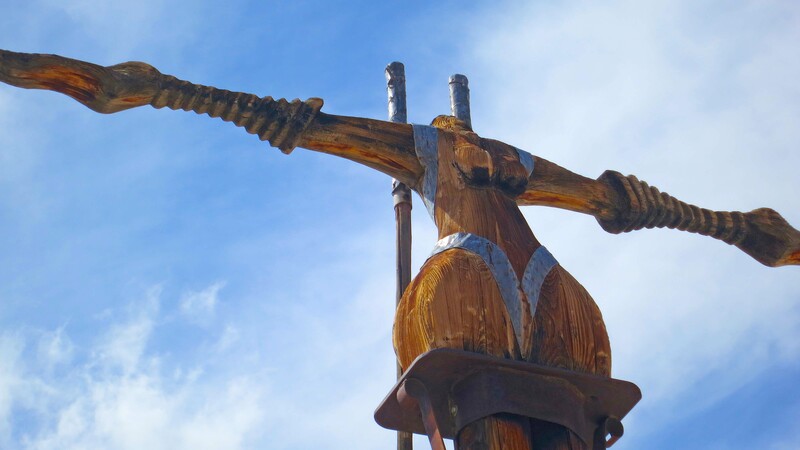 Known as the Venus of Nevada, this 1992 work by Hugo Heyrman is part of the Goldwell Open Air Museum. 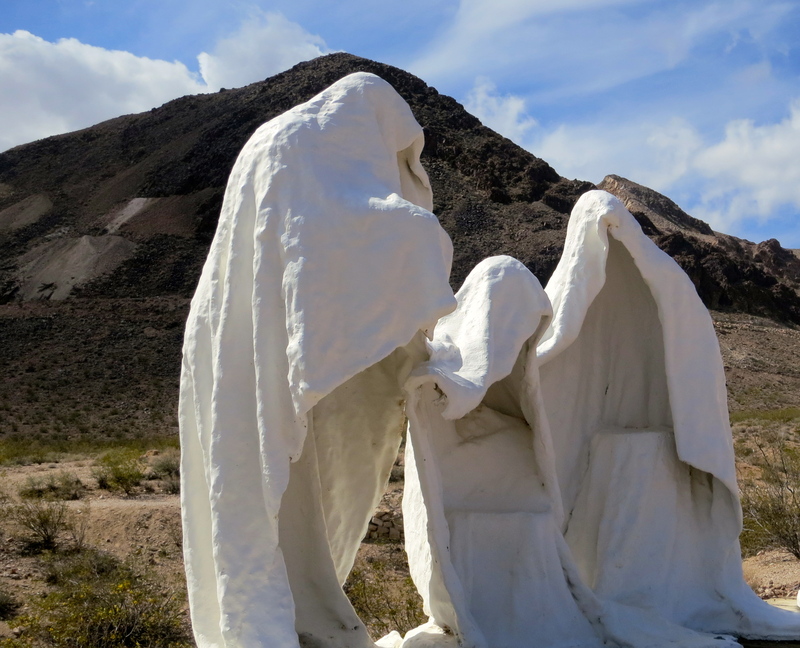 The first time we drove into Rhyolite, I noticed a tall, naked lady with blond hair next door to the town. And no, I hadn’t consumed any peyote or other hallucinogenic drugs normally found in deserts and used by shamans to enter places that might be inhabited by tall, naked, pink ladies. I was gazing down at the Goldwell Open Air Museum, a truly unique art museum in the world of art museums. Goldwell was started in 1984 by the Dutch artist Albert Szukalski as a way to display ghostly figures he created by wrapping live models in wet plaster. 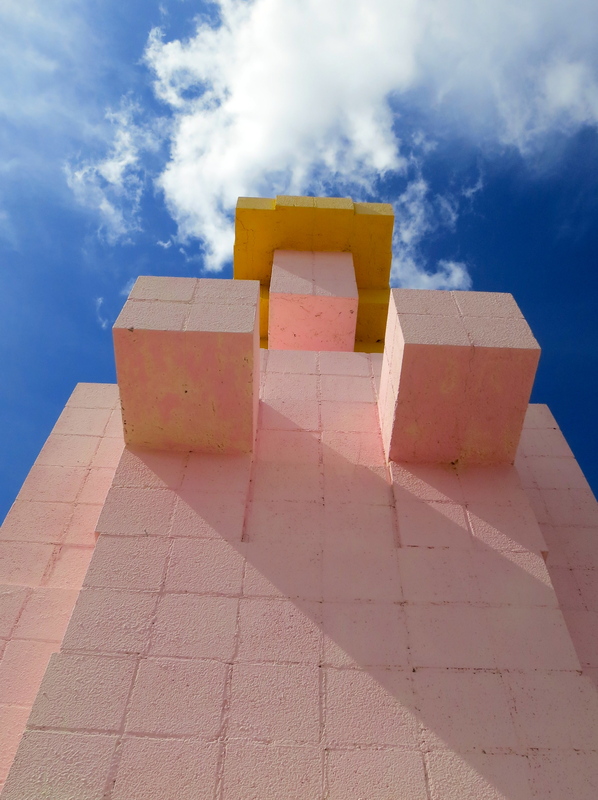 Soon, other Dutch artists joined him in his efforts to create a sculpture museum in the desert. 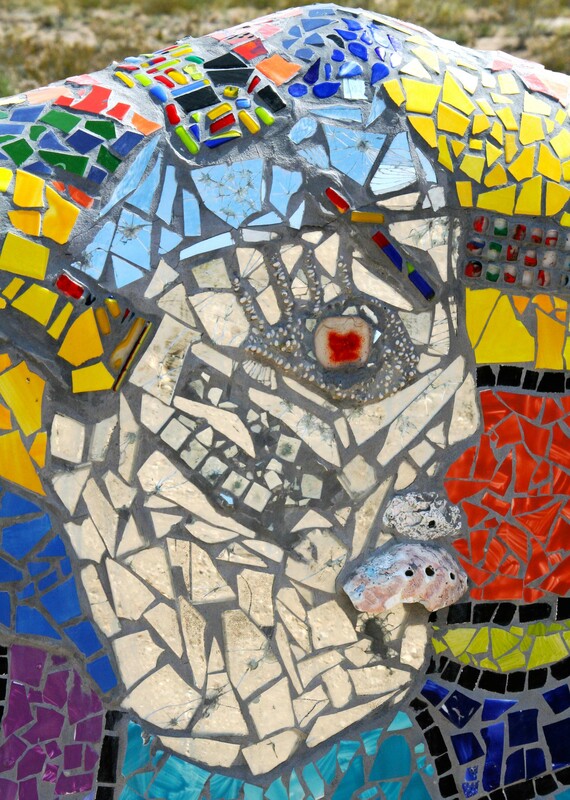 Today, a Nevada non-profit organization cares for the museum and supports on-site artistic endeavors. I’ve blogged about the museum before and I will undoubtedly blog about it again. Why? I’ll let the photos tell the story. 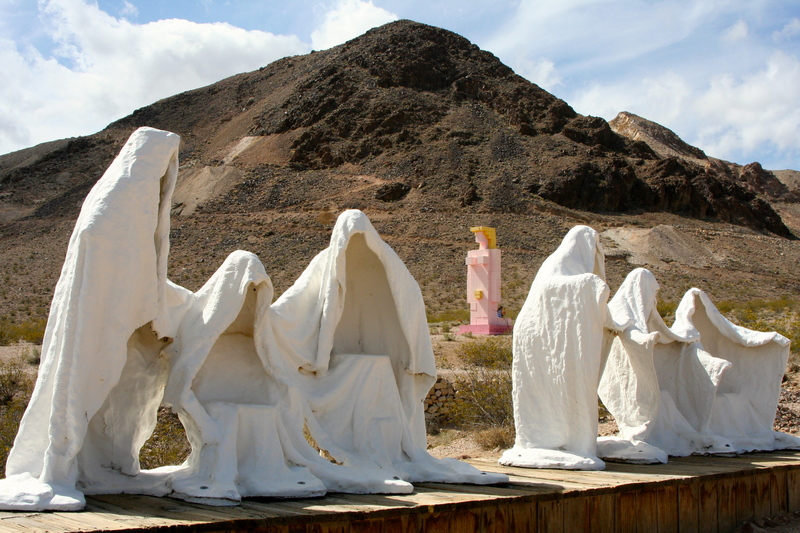 Albert Szukalski’s work, The Last Supper, was the first sculpture created for the Goldwell Open Air Museum. The mountains and clouds provide a dramatic backdrop for the sculpture. Using Davinci’s fresco of the Last Supper as a model, Szukalski wanted a desert setting for his sculpture. Here, the ghostly figures are seen from behind. 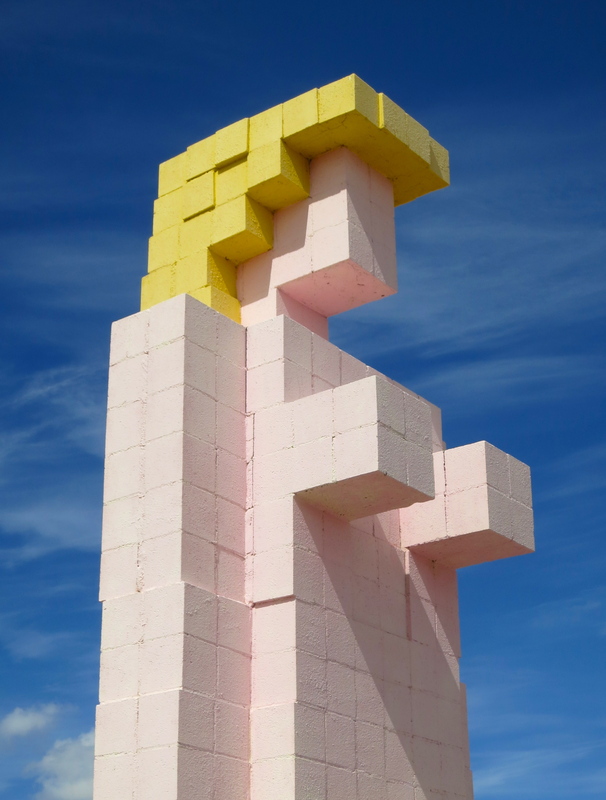 Hugo Heyrman used cinder blocks in his creation of the Venus of Nevada to represent the pixellated, technological world we live in. I found this perspective interesting. Peggy just shook her head. A local resident of the nearby town of Beatty donated his bike and his body for this sculpture by Albert Szukalski. He served as the model by allowing wet, plaster infused burlap to be draped over his body.The sculpture is appropriately named Ghost Rider. Every lonely desert prospector needs a penguin for company, right? Wait, isn’t that a donkey? 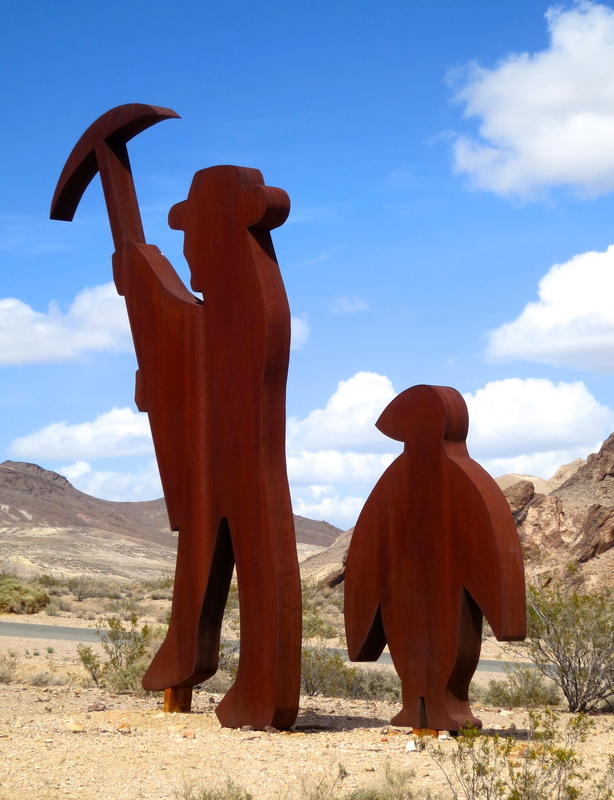 The artist Fred Bervoets decided on a penguin for his tribute to Shorty Harris at the Goldwell Open Air Museum. Shorty was a legendary prospector who worked the Rhyolite area. So Peggy did. The buildings in the background are located in the ghost town of Rhyolite. Dre Peeters named his hand carved statue Icara, a female equivalent of Icarus, the legendary Greek boy who flew too close to the sun. 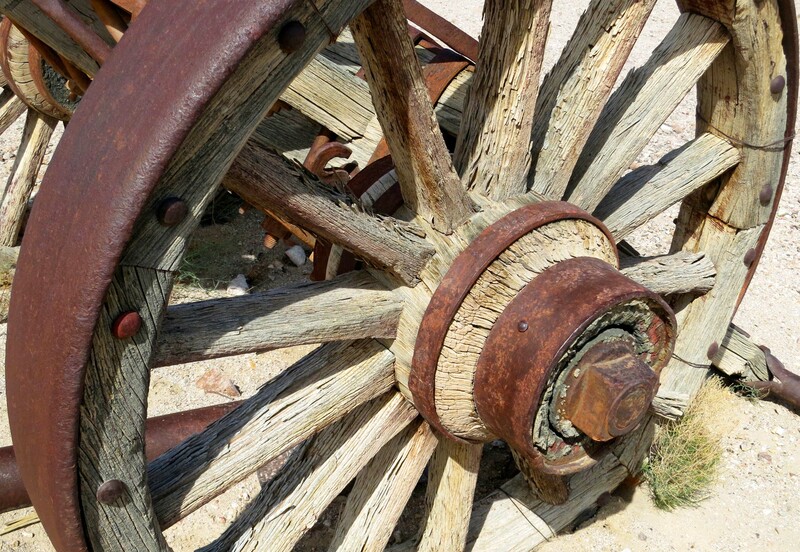 An old wagon was located at the base of the Icara, so naturally I had to take a photo of its wheel. 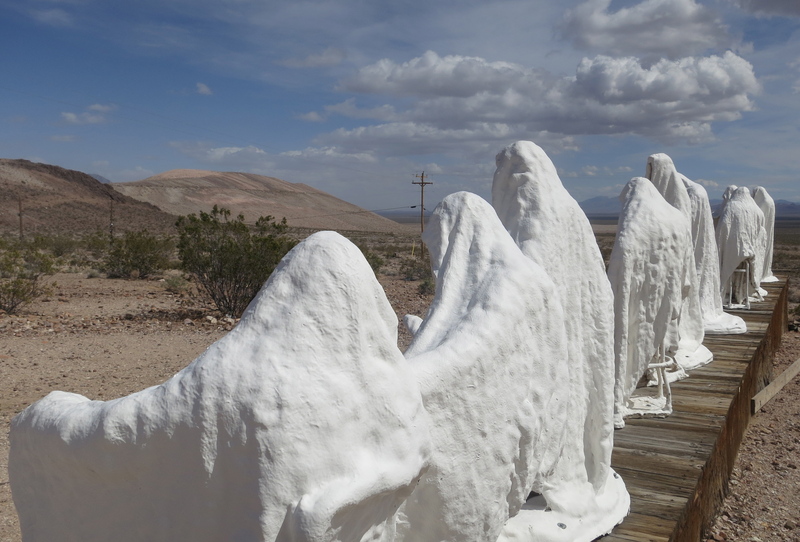 It makes a fitting end for this blog about an art museum located next to a ghost town. 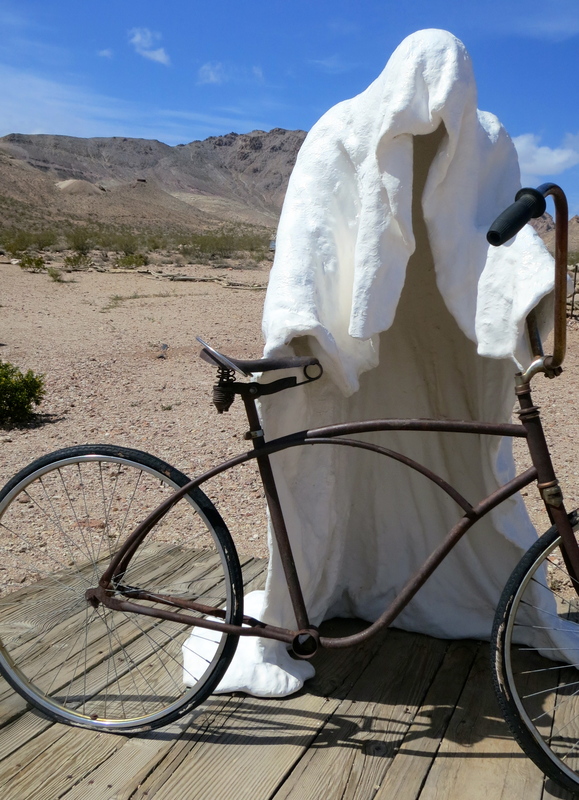 NEXT BLOG: Off to the well know California ghost town of Bodie. Those are cool-even the brick lady! The Ghost Rider’s my favorite. As for the pink lady, my first thought was of sugar cubes, not pixels. I’m more firmly grounded in the analog age than I realized. The best photo may be the one showing the pink lady lurking behind the Last Supper. That’s a great perspective, and amusing in a way I can’t quite articulate. I like the wagon wheel, too. Bodie may be a well-known California ghost town, but I’ve never heard of it. I’m looking forward to the introduction. Those plaster sculptures are something else. All those eerie spaces-for-bodies lined up along that board walk. Vision. Definitely. That’s exactly the right word. Talk about creativity and uniqueness..This place is wonderful.. I love the “Ghost rider” and sofa.. Great shots, Curt!! Another desert treasure. Also looks like everything is made well enough to hold up to the desert. Oh I do love the draped plaster sculptures. This is a really cool post. I’ve never been there but I’m intrigued. Love the funky art and the Ghost Rider, a little spooky, is my favorite. Looking forward to Bodie! Very cool. 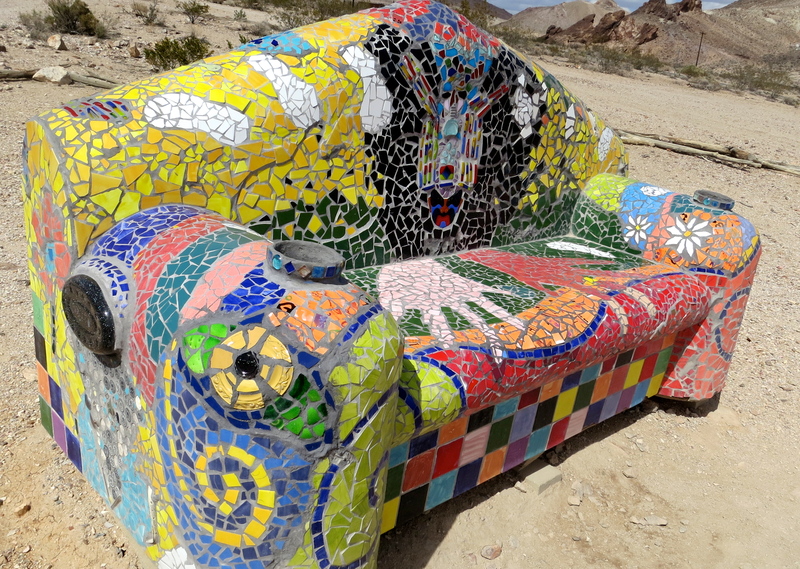 The sofa reminds me of the benches in Park Guell in Barcelona. 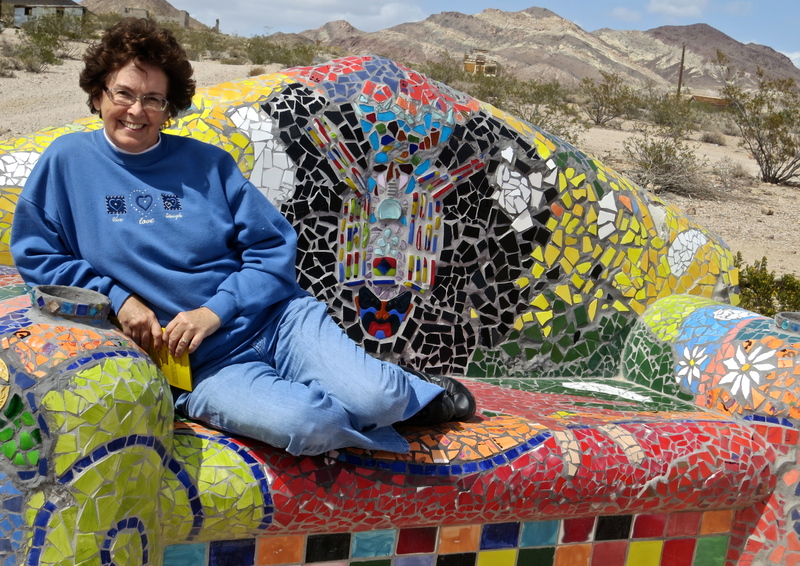 My wife grew up in southern California and she and her family often visited ghost towns on their vacations. I visited Bodie with her a long time ago. Looking forward to seeing it again. Wonderful. Not sure about the sugar cube figure but the rest are very creative and seem to have stood the test of time well. O Wow! Chk out those ghost figures..and that couch! You guys are something. weblog, and I used to pay a quick visit this website all the time.